Treasured OST to vCard Converter Software is result provider application that presents fast, secure conversion OST Contacts to vCard format process along with many another facility. OST Contacts to vCard converter Software support any size of OST file to extract contacts for convert OST Contacts to vCard with preserve data. Convert all Items- Software very fluently convert all contacts of outlook OST file into vCard format. Convert with Entire Contacts Details: - OST to vCard Software is able to convert OST contacts along with entire details into VCF. Preview OST Contacts- Conversion OST Contacts to vCard process will be previewed to satisfied users. No Outlook Installation- To Convert OST Contacts to vCard there no required to Install MS Outlook application. Trail Version Available- Demo allows restore 5 contacts per OST folders into vCard format. Not Defined Size for OST- No size limitation is provided users can export any size OST Contacts file into VCF format. Maintains Folders Integrity- During OST contacts to vCard conversion process, it preserves folders, sub-folders structure. Convert Selective Contacts- Software facilities select the contacts folders from OST file to convert into vCard format. Planning to convert OST Contacts to vCard format? But unable to find reliable solution, have splendid OST to vCard Converter Software that has ability to produce good conversion OST Contacts to vCard format. Outlook installation not required to use the application to convert OST Contacts to VCF file. Software will extract entire contacts along with details like- first name, second- name, emails address, house number etc to convert into vCard for any mobile device or windows systems. 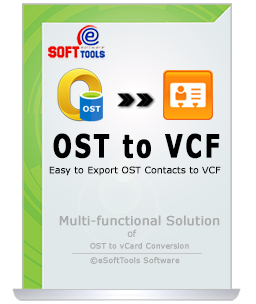 OST to VCF Converter Software allows export only users specified data; it has deep file filter feature that permits you to select the particular contacts from OST file to convert data into vCard format with maintains data. This application has been designed for all type of users like- technical or non- technical and you can easily handle the app without any technical supports. Also, you can contact our experts to get help for installing and operating the app. OST to VCF Converter Software has ability to convert all details from OST contacts such as- first name, last- name, emails address and other related information into vCard format. While conversion, it preserves all data integrity. Clients satisfaction is our first and high priority, we have provided the preview facilities through all customers can easily get the live preview of OST Contacts to vCard conversion process before getting accurate conversion. OST Contacts to VCF Converter Software doesn’t impose any size limitation over OST file to convert OST Contacts to vCard format. Software can export any size of OST Contacts to vCard format with preserve all data integrity. Our OST to vCard Software doesn’t required Outlook installation so that without outlook you can install this OST to vCard Converter Software for conversion OST Contacts to vCard format with each contacts detail. Choose Individually Outlook PST file from hard drive. Can Software export OST Contacts to vCard format without Outlook Installation? Yes, without outlook installation the software allows users to convert their OST Contacts items into vCard format. Can I convert multiple OST folders into VCF format with Software? Yes, with OST to vCard Converter Software you can convert multiple OST Folders into vCard format. Can I convert only selective OST Contacts to VCF format by Software? Yes, you can convert selective contacts folders from offline OST file into vCard format with using the software. Is there any size limitation of OST contacts file for Conversion its data into VCF? No, there no size limitation defined- Export any size contacts of OST file into vCard format by the software. MS Outlook should be installed on computer. MS Outlook must have active or dummy profile. This is magnificent program, I personally used this OST to vCard converter software for conversion OST Contacts to vCard format along with complete contact details like- first name, last- name, emails address etc. I liked its preview facility that provided me hint of each OST items conversion.……….. I am very happy after using OST Contacts to vCard converter Software because it helped me in conversion of my OST contacts to VCF file. It allows convert the selected contacts of OST file with preview facility……….Thanks a lot..